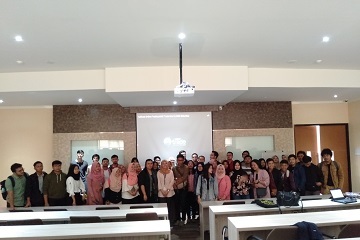 The Bogor Agricultural Business School (SB-IPB) in collaboration with MNC Sekuritas and the Indonesia Stock Exchange (IDX) held a Prospective Investor Forum. This forum was held in Campus C of the SB-IPB Campus, Bogor on Saturday (09/02). This forum was attended by students, alumni and teaching staff. "Prospective Investors Forum is held to accommodate students, lecturers, and alumni to learn many things related to business, including investment and capital markets. Actually MNC Sekuritas has offered this collaboration for a long time, but our party is not ready because of the organizational changes. This forum is the beginning of our collaboration. Many other companies offer cooperation, but we did not put into prioritize, "said Agustina Widi, a lecturer in SB-IPB. The forum presented two competent speakers in investment matters, namely Mia Muthia (Executive Trainer of the Indonesia Stock Exchange) and Anggraita Dewi (MNC Securities Online Marketing Trading). Mia explained the lack of investment education in the community. "Most of Indonesia's expenditure is spent on fulfilling the consumptive lifestyle. In Indonesia, the position of foreign investors still dominates because they see company opportunities. Many benefits are obtained when we make investments. One of the great opportunities to invest is to put shares in the capital market. The benefits are capital gains, corporate action, and are invited to the General Meeting of Shareholders (AGM), "Mia added. Meanwhile, other speakers namely Anggraita described the ease of investing with their online trading application. "With this application we don't have to bother investing in stocks. Trading can be anywhere. We can also monitor our shares through mobile phones, "she said. Prospective Investor Participants looked enthusiastic by giving a lot of critical questions. IPB has previously collaborated with MNC Sekuritas by inaugurating the IDX Sharia Investment Gallery at the Faculty of Economics and Management of IPB.